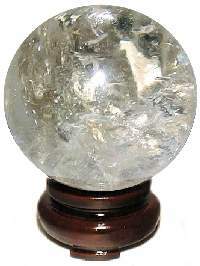 55mm Clear Quartz Crystal Spheres / Balls from Brazil. Hand picked from 100's of spheres direct from the mines, these Clear Quartz Spheres have good clarity with some veils, rainbow inclusions and small milky semi-translucent portions. Quartz Crystal is a staple of Feng Shui Chi cures and is said to heal past wounds and re-vitalize one's Life or Chi energies. Excellent polish and finish with no cracks. The Oriental Rosewood Stand is sold separately. 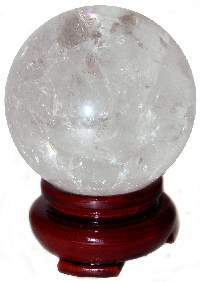 60mm Clear Quartz Crystal Spheres / Balls from Brazil. Hand picked from 100's of spheres direct from the mines, these Clear Quartz Spheres have good clarity with some veils, rainbow inclusions and small milky semi-translucent portions. Quartz magnifies the personal life force at the core of your being and enhances its flow, nourishing the mind, emotions, and physical body. Excellent polish and finish with no cracks. The Oriental Rosewood Stand is sold separately. 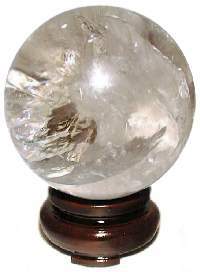 65mm Clear Quartz Crystal Spheres / Balls from Brazil. Hand picked from 100's of spheres direct from the mines, these Clear Quartz Spheres have good clarity with some veils, rainbow inclusions and small milky semi-translucent portions. Quartz Crystal is a natural time keeper and conductor of energy. Quartz has been part of human life for unrecorded eons, as a tool, ornament and healing stone, a partner in human development which continues on today. Excellent polish and finish with no cracks. The Oriental Rosewood Stand is sold separately. 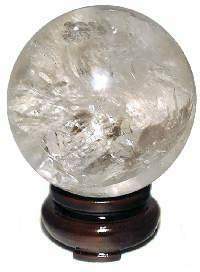 70mm Clear Quartz Crystal Spheres / Balls from Brazil. Hand picked from 100's of spheres direct from the mines, these Clear Quartz Spheres have good clarity with some veils, rainbow inclusions and small milky semi-translucent portions. In Gem Lore, the use of Quartz Crystal magnifies the personal life force or Chi energy at the core of being and returns one to the natural healing rhythms of daily life. Excellent polish and finish with no cracks. The Oriental Rosewood Stand is sold separately. 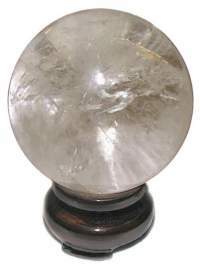 75mm Clear Quartz Crystal Spheres / Balls from Brazil. These large Clear Quartz Spheres have good clarity with some veils, rainbow inclusions and small milky semi-translucent portions. Quartz Crystal is a staple of Feng Shui Chi cures and is said to heal past wounds and re-vitalize one's Life or Chi energies. Excellent polish and finish with no cracks. The Oriental Rosewood Stand is sold separately. 75mm or 3" Sphere - 1lbs 3.5zs.